A prototype of the Samsung Galaxy S10 Plus has just leaked showing off what looks to be a corner notch that sports a dual camera on the front of the device. Posted by SlashLeaks, the photo suggests the phone will sport the notch in the top right rather than in the middle like on some other handsets. 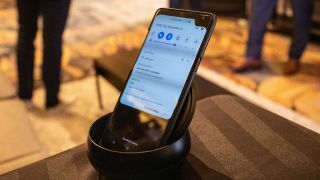 It looks similar to a handset on display at Qualcomm's Snapdragon Summit last week that showed off a device capable of a 5G connection but also sported a similar style of notch. That's the device you can see at the top of this story. The source who provided the photo of the Samsung Galaxy S10 Plus has claimed there's protective film over the device in the image, so that may be what makes it look like a notch. It could be this is just camera holes on the top right hand corner of the device rather than a notch extending from the very top. In any case, whether this will follow suit for the standard Samsung Galaxy S10 as well remains to be seen, but another image gives us some clues. The render below showing the Samsung Galaxy S10 appeared over the weekend too with Forbes posting this case render of the new device. It looks like the bezels will be super slim like on the Samsung Galaxy S10 Plus we saw, but there's no notch on display with instead just a camera cutout in the top right. A triple camera setup sits on the rear of the phone in a horizontal line, but the exact specs of the camera remain to be seen. What we can expect is to learn more about the S10 range in the run up to the launch next year, which is expected to be in the first couple of months of 2019.